Home > June 2018 > Oxygen…Neutral or malevolent for aerosols? Oxygen…Neutral or malevolent for aerosols? Oxygen is ubiquitous. In molecular and combined forms, it constitutes about 50% of the earth’s crust. The oceans, lakes and rivers are 88.2% combined oxygen. Rocks and soil contain 46.2% and the troposphere holds 23.14% (20.95% oxygen by volume). Without oxygen, mankind would perish within a few minutes. Still, oxygen challenges us. It can react with organic and inorganic substances, even at ambient temperatures, to produce both useful and deleterious compounds. Oxygen has six isotopes. Three are radioactive and three are stable. 16O2 comprises 99.759% in abundance. 17O2 and 18O2 total 0.241%. 18O2 (“labeled oxygen”) is used to parse certain organic compounds to learn their synthesis pathways. Liquid oxygen is blue, liquid ozone is deep blue and explosive, pure hydrogen peroxide is blue and explosive and certain forms of water (ice) range from light blue to deep blue with a purple tinge. All are colorless when in diluted liquid form. For nitrosols and compressed air dispensers, a directional dot should be used to help prevent depressurizing the head space. The actuator must be aligned to the dot during production. Oxygen is very active, forming oxides, peroxides and related compounds with every known element except helium, neon and possibly argon. A vast number of oxygenated organic compounds, alcohols, ethers, aldehydes, etc. are also recognized. Many can be created at ambient temperatures, such as the corrosion of iron (forming rust), which is both widespread and very complex. Atmospheric (ground state) oxygen is paramagnetic and is more technically described as triplet oxygen, 3O2. It is relatively inactive unless heated. However, under the influence of UV light and sensitizers, it can be converted to singlet oxygen, 1O2. This, and the related anionic free radical (O2–•), are extremely active, attacking many organic compounds to produce hydroperoxides that can degrade into various other compounds, some of which may be clinically troublesome. These oxidations do not take place in aerosol cans because of the absence of light, but they may affect applied skin and hair care products unless they are protected by such naturally present enzymes as catalase and superoxide dismutase (SOD). If these defenses are overcome, skin problems such as acne, irritation, comedogenic lipids and carcinomas may result. Chemical antioxidants do not prevent the formation of singlet oxygen species. A wide variety of sensitizers have been alluded to in industry literature, such as Rieger, M.M., et al., Cosmetic & Toiletries, 104, (October 1989). They include enzymes, flavins, porphyrins, melanines and such urban air pollutants as benzene and nitrogen dioxide. The rate of singlet oxygen oxidation of ascorbic acid increases hugely if catalytic traces of copper ion are present. As is well known, trapped air increases aerosol pressures, may oxidize some sensitive ingredients and may influence the rate of can corrosion. Techniques for reducing head-space air include vacuum crimping, purging and sparging. Vacuum crimping is the most popular by far. The unofficial industry standard is to apply a vacuum of 20 ± 2″ of mercury (508 ± 51 mm Hg. ), although many fillers set their controls to about 18″–19″ for economic reasons. This eliminates about 62% of the air in the head space. There is always a slight increase of head-space air, as the aerated concentrate unloads a portion of its dissolved air into the gas phase. Air readily dissolves in stirred water to the extent of 15.64 mL per liter at 86°F (30°C). The dissolved air then contains 33 volume-% oxygen at 86°F, since oxygen is more soluble than nitrogen. The head-space oxygen available to participate in possible corrosion reactions is about 27.4 = mg per 100mL at 77°F (25°C) and 760 mm Hg. Vacuum crimping and other methods decrease this amount. If the oxygen supply is totally depleted (rare) any corrosion of the aerosol can will usually stop, unless there are alternative oxidizing species in the formulation. Purging has been used on occasion, sometimes with vacuum crimping to further reduce the trapped air or oxygen content. The purging gas is usually nitrogen or carbon dioxide. On the production line, streams of purging gas may be directed into moving cans using flexible tubes. This is wasteful since a large portion of gas is lost between cans. Alternatively, in-line or rotary machines can be applied. In a tunnel device proposed by G.B. Diamond, carbon dioxide is filled into a compact, flap-ended tunnel. Cans enter the tunnel and the head-space air is displaced by the much heavier carbon dioxide. By adjusting operational conditions, well over 90% of the air can be removed. In most cases, the retention of very small levels of carbon dioxide is not a problem. The use of another heavier-than-air gas, such as argon or Solstice HFO1234ze, is an untested possibility. Sparging is an inefficient technique for head-space air reduction, but it has been used commercially, always with vacuum crimping, for water-based insecticides and various other aerosol products. It involved inserting a multi-perforated ball that is filling with nitrogen into the concentrate feed line. By adjusting the nitrogen pressure to about 10–20 psi greater than the line pressure, the “bubbler ball” forces the gas into the concentrate. When the product reaches the filler bowl, the pressure drops to atmospheric and most of the nitrogen bubbles out, taking most of the air (oxygen) with it. The air content of saturated water is 17.08mL per liter at 77°F (25°C), equal to 5.78mL per liter of oxygen. Some fillers prefer to heat their tanks of de-ionized water to about 160°F, (71°C) “to remove the air.” Actually, at 160°F, the solubility of oxygen is still significant, at 3.68 mL per liter (even in 212°F water, 2.70 mL per liter remains). It follows that heating water to 160°F is rather inefficient in reducing the already very small amount of oxygen that it may contain. Because of the challenges presented by oxygen species and associated free radicals, many cosmetic products include various antioxidants in their formulas. They act by removing free radicals (including lipid peroxyl radicals) and chelating metal initiators. Antioxidants also reducing those substances produced by singlet oxygen species, such as hydroperoxides, thus preventing them from further degradations. There are many causes leading to skin damage. They include exposure to ozone, nitrogen dioxide, UV light and the endogenous production of singlet oxygen species. The skin is also subject to stress factors, such as atopic dermatitis, icythyosis, psoriasis and pruritus. There are three types of antioxidants. The lipid soluble variety includes vitamins A and E, as well as their relatives, carotenol, BHA (substituted anisole mixture), BHT (substituted toluene), hydroqinone and many others. The water soluble category includes uric acid, ascorbic acid (vitamin C), glutathione and others. The final group includes certain enzymes, such as superoxide dismutase (SOD), mentioned earlier. Metallic lithium reacts to form lithium nitride (Li3N). A few transition-metal complexes can slowly form. Symbiotic reactions occur on certain plant roots, such as peas and beans. The gases can be used in both regular and bag-on-valve (BOV) aerosols. Mechanical break-up (MBU) actuators must be used to achieve a spray, which is generally medium/coarse to coarse. With other actuators, the product may simply stream out, going as much as 20′ (6.10 meters) when the aerosol dispenser is initially used. However, as the product is used, the pressure decreases and the “reach” of the stream lessens. This will be important for wasp and hornet sprays, but less so for yellow jacket bee sprays where the insects live in underground nests. Nitrogen is almost insoluble in water: 2.35mL per100 mL of water at 32°F (0°C) and 760 mm of Hg. The solubility increases almost linearly with increasing pressure, so that about 23.2mL dissolves in 100mL of water at 130 psi-g. at 32°F. About 16.2mL dissolves at 77°F (25°C). Note: the volume of dissolved nitrogen is illustrated for standard pressure and temperature (STP) conditions: 0°C and 760mm. Nitrogen is much less soluble than oxygen or air, both in water and other liquids. 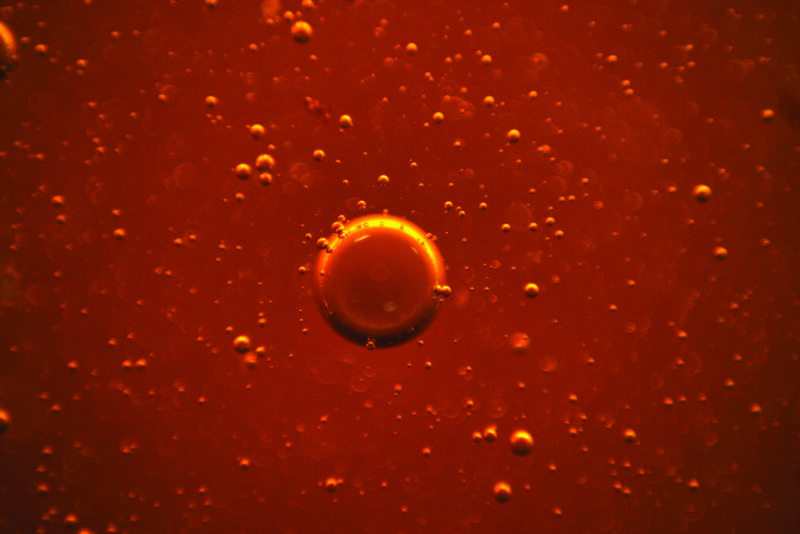 For pressure considerations, the tiny solubility can be neglected. However, it becomes physically evident in the dispensing of foams and other liquid products. For example, syrups and honey can be extruded while looking normal, but then slowly turn white as millions of tiny gas bubbles surface. Shortly afterward, when the bubbles burst, the product returns to its regular appearance. Historically, inadvertent out-gassing of these compressed gases, even if very brief, was linked to huge pressure drops and product failure. Can inversion does pose a problem, but not an insoluble one. There are aerosol products where the dispenser would almost never be inverted and actuated, such as air fresheners and perhaps flying insect sprays. 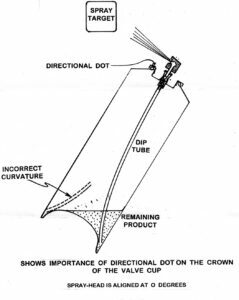 By the use of directional dots, diptubes can be oriented to the lowest corner of tilted cans, allowing the product to be sprayed even when the can is almost horizontal. The use of “360 degree” valves can be considered. Low delivery rate valves will minimize pressure loss if inversion occurs. Lastly, there is the “Hold Can Upright” labeling option. Potential marketers will have to carefully weigh the attributes. The comments do not apply to BOV aerosols, which can be safely operated with the can in any position. Since the “airosols” and “nitrosols” closely follow Boyle’s Law, the absolute pressure will diminish linearly with head-space enlargement, i.e. the absolute pressure will drop by 50% as the head-space increases by 100%. With this in mind, one can calculate pressure drops as the aerosols are dispensed. At final pressures of about 35 psi-g (70°F), the water-based formulas will continue to produce acceptable sprays with a reasonable delivery rate. For example, starting with a pressure of 88 psi-g (70°F), an aerosol filled to 50% of its capacity will have a pressure of 38.1 psi-g when 95% is dispensed. A still higher initial pressure will allow a larger product fill. For example, an aerosol with a 68% of can capacity, pressurize with nitrogen to 142 psi-g at 70°F will have a pressure of 37.3 psi-g when 95% has been dispensed. If this initial pressure seems excessive, according the Charles’ Law, the 130°F pressure would be 159, so that one can utilize the popular DOT 2Q specification aerosol can, which is approved up to 180 psi-g.